Galea (A. Parnis), F. Apap, L. Grima, J.M. Vella, C. Mercieca, J. Pace, A. Mizzi, J. Bajada, H. De Souza Maciel, E.A. Da Silva, E.P. Lattes. Camilleri, I. Darmanin (A. Ebejer), A. Caruana, R.A. Buhagiar, M. Nikolic, S. Vella (J. Camilleri), A. Farrugia (E. Ciappara), J.V. Magri, J.P. Formosa, N. Caruana (K. Buhagiar), D. Grech. Siggiewi, who are currently struggling to avoid the bottom places in the standings of the MFA BOV second division campaign, registered a surprise outcome in the match from the second round of The Malta FA Trophy by obtaining qualification to the third round of the competition at the expense of Gozitan champions and current leaders of the GFA BOV Gozo Football League first division Victoria Hotspurs. Siggiewi earned the qualification with a win in the penalty shoot-out as the match after extra time ended in a draw of two goals. The Hotspurs, who were hot favourites for the qualification had an excellent start and scored a goal during the opening minutes of the encounter but as time passed by they found it difficult to convert their superiority into goals so that they ended up with a players less on the field just before half time and as time passed by they became nervous in their paly and erratic in their finishing. Siggiewi had a defensive deployment and managed to retain composure despite the fact that they conceded an early goal. They also clinched the equalizer by taking full advantage of a mishap at Victoria’s defense and as time passed by they grew in confidence and ended up celebrating the victory following a series of seven penalty kicks by each side. The Hotspurs took command of play form the very beginning and opened the score in the third minute of play when a direct free kick by Elton Da Silva was saved by goalie Roderick Camilleri with the aid of the crossbar and from the rebound Christian Mercieca placed easily in goal. The Hotspurs tried to increase their pressure on Siggiewi’ defense and on 10 minutes they were again dangerous through a direct free kick by Elton da Silva that ended just high. However, Siggiewi recovered from the difficult phase where they were too timid and increased their concentration at their defense so that they kept their area clear from danger for longer periods. The Hotspurs seemed over confident and did not manage to conclude their play into serious attempts at goal. On 31 minutes Victoria’s Emiliano Lattes took the ball following a short clearance by the defense but the ball got a deflection and the action ended in a corner. Siggiewi had their first serious attempt towards Victoria’s goal on 39 minutes through an effort by Jean Paul Formosa that ended wide. On 41 minutes the Hotspurs were reduced to ten players when Jason Pace floored Jason Vincent Magri who as entering Victoria’s area and the referee awarded a free kick to the visitors and showed the second yellow card to Victoria’s lateral defender. From the resultant free kick Marko Nikolic attempt ended high. The Hotspurs continued to enjoy territorial supremacy with a player less on the pitch and in the first minute of stoppage time before half time they could have doubled the score but Elton Da Silva’s first timer following an inviting low cross by Christian Mercieca ended inched wide with the goalkeeper beaten. After the break the Hotspurs came out more determined to score their second goal and on 46 minutes a shot by Elton Da Silva following a personal action ended on the side of the net. Three minutes later Henrique Maciel had a good header following a free kick by Emiliano Lattes that ended just over Siggiewi’s goal and on 59 minutes Victoria’s Andrew Mizzi passed to Christian Mercieca who had his shot form a good position that was blocked by the defense. Two minutes later Elton Da Silva had another good strike that was neutralized in two attempts by Siggiewi’s keeper. The Hotspurs were punished for the missed chances as Siggiewi levelled the score on 62 minutes when Victoria’s defense failed to clear the ball from their territory, Siggiewi’s striker Marko Nikolic took the ball just outside the area and netted with a low shot that was out of the reach of the goalkeeper. The Hotspurs were shocked and tried to produce an immediate reaction in an attempt to regain the lead. On 67 minutes Elton Da Silva’s shot from a good position missed the target and the same Brazilian striker had another effort five minutes later that was well saved by Siggiewi’s goalie. The same keeper was again called to make an important intervention on 74 minutes to block a shot by Victoria’s Ferdinando Apap and on 77 minutes the Hotspurs had a goal by Elton Da Silva that was disallowed for an offside position. Siggiewi replied on 83 minutes through a shot by Marko Nikoic that was blocked by Victoria’s defense and on 86 minutes Siggiewi’s goalkeeper Roderick Camilleri partially saved a strike by Joseph Mario Vella and form the rebound Elton Da Silva’s first timer ended away from the target. The Hotspurs continued to give away some good scoring opportunities and one minute later Elton Da Silva released Christian Mercieca inside Siggiewi’s area but the latter hit badly and the defense cleared the danger. On the stroke of regular time a free kick by Victoria’s Henrique Maciel ended away from goal and in the third minute of stoppage time an effort by Elton Da Silva was partially saved by Siggiewi’s keeper and from the rebound Da Silva’s weak header was neutralized by the same keeper so that the score remained unchanged and the match had to go into extra time. During the first period of extra time the Hotspurs continued to put pressure on Siggiewi’s defense despite playing with a player less. On 97 minutes a curling shot by Elton Da Silva ended inches away from Siggiewi’s goal and two minutes later a shot by Henrique Maciel was well saved by goalie Roderick Camilleri. Victoria went very close to regain the lead on 103 minutes when a header by skipper Ferdinando Apap from a corner action was blocked by the defense and from the resultant melee Andrew Mizzi’s low shot was cleared off the fatal line by Siggiewi’s Marko Nikolic. Until the end of extra time the Hotspurs continued to hold play within Siggiewi’s territory but failed to find a way to create other good opportunities to beat Siggiewi’s defense. The score remained unchanged and therefore the qualification had to be decided through a penalty shoot-out. The two teams scored their respective three penalty kicks. Siggiewi scored though Marko Nikolic, Kim Buhagiar and Darrell Grech, while the Hotspurs replied with penalties converted by Henrique Maciel, Christian Mercieca and Emiliano Lattes. Siggiewi’s fourth penalty kick by Eman Ciappara was saved by Victoria’s keeper Adrian Parnis with the aid of the post but the Hotspurs did not take advantage of the situation as the penalty kick by Joseph Mario Vella was stopped by the post. The two teams scored two other consecutive penalties each. Siggiewi through Jason Camilleri and Jacob Vincent Magri and the Hotspurs through Elton Da Silva and Jonathan Bajada. 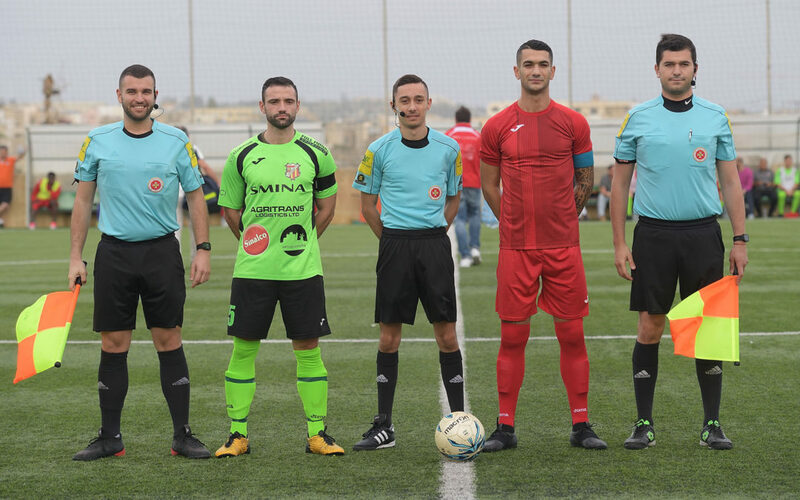 The qualification was actually decided in the seventh penalty kick as Siggiewi scored their shot from the spot kick through Jean Paul Formosa but Victoria’s penalty kick by Andrew Mizzi was stopped by the crossbar.